Forward reverse starter with timer 3 phase motor wiring diagram. In my last posts I share the wiring diagram of forward reverse three phase motor starter and also the 8 pin timer wiring diagram. This post is about the main and control wiring of forward reverse starter with timer. In the below diagram the main wiring for 3 phase motor is also shown and control wiring is also shown. In the diagram two magnetic contactor shown which coil operated on 220 volts. You must need the neutral wire. However if your magnetic contactor coil is operated on 380 volts then you do not need neutral wire. In the forward reverse starter with timer diagram. The thermal overload relay shown, a normally close push button and two normally open push button shown. In the below forward reverse with timer starter diagram. The timer is used for automatic off (or automatic switch off the motor when the motor complete his running time. All the wiring connection of forward reverse starter with timer shown. The timer is used only for one contactor. And timer will only switch off one contactor with its complete his time. The control wiring of starter is shown clear to understand. If you want need more help then also read the below post. How on delay timer works (8 pin timer) diagram. I hope after reading all the related wiring diagram with forward reverse with timer starter diagram. Now you will be understood. However if you have any question according the post then you can ask in below commenting section. Shunt trip breaker wiring diagram, This post is about the single wiring diagram of mccb shunt trip breaker. In the diagram a MCCB (molded case circuit breaker) shown which is wired for 3 phase system. The breaker shunt trip coil is controlled by the emergency switch. Which is also known with the name of kill switch. In the above MCCB shunt trip breaker wiring diagram. The incoming 3 phase 4 wire system supply shown. The shunt breaker is 3 pole. Which is used for 3 phase system. But the coil of shunt is 220 VAC. So neutral is required also. The neutral wire is connected to the shunt coil. And line wire is controlled with kill switch. The kill switch normally open contacts are used. Also the symbol diagram is shown. This post is about the automatic water level controller wiring diagram. As you know that there are different type of water level controller available in market or online markets. But all liquid level controller wiring connection and installation mostly same. In this post I am sharing with you the automatic water lever controller diagram with complete installation method. You can buy this water level controller from amazon.com. However this diagram help you to understand the wiring and installation of water level controller. Automatic Water or Liquid Level Controller Wiring Diagram. can run the motor manually and automatic using the switch. You can use this water level controller for single phase motor, 3 phase motor and also for DC water pump motors. However you need some more starter for controlling the motor. In next motor I will share a diagram which help you motor to understand the installation of water level controller. Not that if you want to use the controller for one tank then common three wires with one another. For example if you want to use if for only over head tank. Then common C, UH, UL with one another. 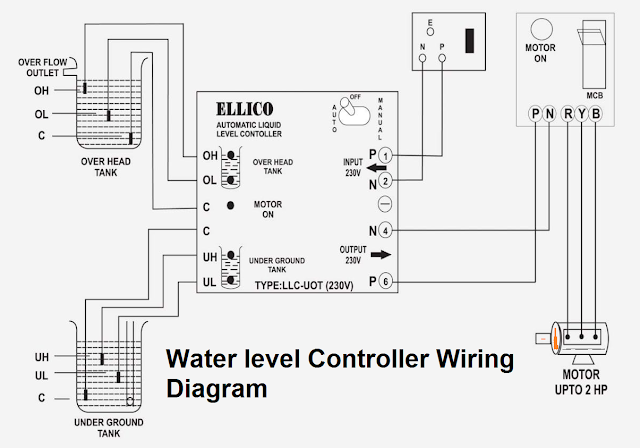 I hope this ellico automatic water level controller wiring diagram help you. This controller is made by ELLICO and you can buy it from the Amazon. This post is about the autonics fx4 counter wiring with direct online starter and proximity sensor with complete diagram. In the post I shown a diagram of complete wiring of direct online starter with mccb circuit breaker, magnetic contactor, thermal overload relay or 3 phase motor protection relay, Normally open push button switch, normally close push button switch, fx4 counter and proximity sensor with complete wiring connection. The wiring is divided- in two parts. main wiring and controlling wiring. First I will talk about the main wiring which is about wiring for the 3 phase induction motor. And the 2nd wiring is controlling of direct online starter with Autonics fx4 counter with proximity sensor. First see the autonics fx4 counter connection with direct online starter diagram. Then I will explain step by step.. In the above counter with dol starter diagram. The 3 phase supply L1, L2, L3 (red, yellow, blue) is connected to the MCCB (molded case circuit breaker). After the MCCB Circuit breaker the main supply is connected to the magnetic contactor main terminals. And after the contactor the 3 phase supply goes to thermal overload relay. After the thermal overload relay the 3 phase supply goes to the 3 phase induction motor. The earth connection is also connected the 3 phase motor. The magnetic contactor and fx4 counter will work on 220 VAC. It's means that we also need the neutral wire. So first of all connect the neutral wire to the NC terminal of thermal overload relay. if you connect the it to 95 terminal then get supply to from the 96 terminal. After that provide the neutral wire to the contactor A1 coil terminal and counter 9 terminal. As I shown the neutral wire connection with black color in above diagram. After get the line supply from one of the above lines. I get the Line wire from the L3 which you can see in the above diagram. The line wire is shown with red color. The line wire is connected to the normally close push button switch. After that the wire goes to the normally open push button switch. From there a red color wire goes to the Normally open auxiliary contacts for magnetic contactor. This is called hold current wire. After that the hold wire will goes from the other side of auxiliary contact and connect to the counter 1 and 2 terminal. From the normally open push button switch a blue color wire will connect to the counter 3 terminal and contactor A2 coil terminal. This is called touch or starting current wire. That is all. Soon I will upload video about the autonics fx4 counter connection with direct online starter and proximity sensor working video and diagram explanation video. Autonics Fx4 counter with proximity sensor diagram, today i will share the diagram of fx4 counter which a digital counter made by the autonics company. This counter have a digital display and 8 switches for increasing or decreasing the counting. This counter is used with proximity sensor. In the fx4 counter we have 14 terminals for connection. In which 1 and 8 terminals for AC supply 220 VAC. You can also use a 7 VA transformer to provide the electric power to the autonics fx4 counter. The 9 terminal is for 12 Volts DC 50ma and 12 and 13 terminal for CP1 And CP2 for sensor sensing wire. The 14 terminal is for O volts DC or negative terminal for proximity sensor. In the proximity sensor we have 3 wires. The brown color wire for 12 Volts or 24 Volts DC. The blue color wire is negative and black color wire is for sensing. In the below i shown the complete fx4 counter wiring diagram with connection of proximity sensor. Also i shown the AC supply connection with counter.